They have stuck by you through thick and thin. They have laughed with you at the most inappropriate times and cried with you when that jerk broke your heart. Best friends, what would we do without them? You certainly could just send them a thank you card or some flowers to express your love and gratitude or you could stitch up the most awesome pattern ever. Which do you think will last longer? 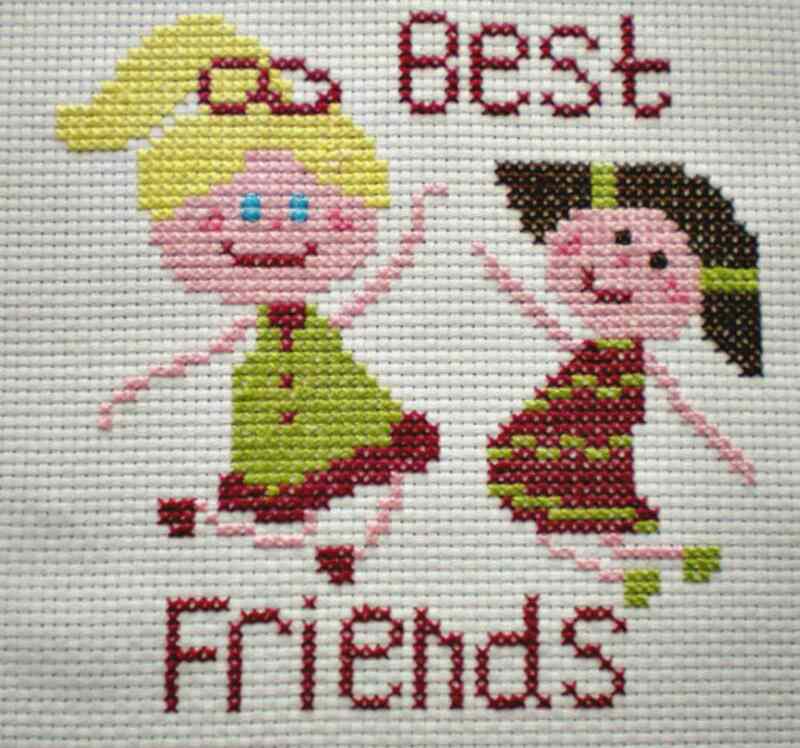 Grab your best friend, your stitching supplies and cross stitch some of the most awesome friends patterns out there. Remember when you were a little kid and you had a best friend. You two did everything together. Summertime was the best. You slept over at each other's house, went swimming, did crafts. The pattern Best Friends by CordyLion Creations takes you back to those days. The little stick drawing is too cute and reminds you of those summer days. You can see this pattern as well as others at their online shop HERE. Anyone can have a mundane boring friendship, but not you! You have friendship to the max! You are in it to win it! Stitched By Unicorns has the best friendship pattern inspired by the awesome comic book series, LumberJanes. What a fun gift this would be for girls at camp. They can read the series and learn to stitch while making best friends for the summer and beyond. Looking for some fun geeky cross stitch love? Check out their shop HERE. You and your best friend are completely on the same wavelength. You can finish each other's sentences, with just a glance the two of you can break out into laughter. She got your back and your got hers. Sewing Seed takes that friendship to another level with their pattern for Best Friends: Goat and Llama. This quirky project is perfect for your slightly off but always awesome friendship. Have fun with this and other patterns with their online store HERE. Has there been someone in your life that was a thorn in your side? Someone that just completely rubbed you the wrong way? Why not take that aggression and instead of acting out, stitch up something sweet to give to them. Who knows? They might end up being your best friend or even more. Steph X Stitch takes this funny line from the movie Stepbrothers and makes a sweet, yet hysterical pattern. Her patterns are quirky, saucy, definitely not for the faint of heart and you can find them HERE. When I was a young girl my best friend and I bought those Best Friend charms. She kept one side and I kept the other. There was no other piece of jewelry that mattered more to me. It was more than just a little piece of metal, it meant that someone truly cared for you other than your parents. Your best friend really is your first serious relationship. The Quote Wall Design has stitched up a hoopla that is a homage to those wonderful charms. You can see this hoop and other patterns for purchase HERE. Friends go together like peanut butter and jelly, mac and cheese, peas and pods....toilet paper and poop? Everyone knows that these two things will always be best friends! They depend on each other through the thick times and ummmm....thin. Crazzzy Stitch takes bathroom humor and makes it super cute with this pattern. It would be the best if you stitched up this pattern for your best friend or make it for yourself for some bathroom fun. You could do a whole bathroom with cute potty humor from their website. Hopefully, you and your best friend will be besties until you are old and senile. Once that happens, you can start being best buds again! Once you have a special friend in your life, don't let them go. Keep them in your life forever. Nerdy Little Stitcher's pattern needs to be stitched up and given to your best friend forever. You can see the pattern HERE. Your best friend is the only one who truly understands you and still loves you! They will be there forever. Stitch up a pattern to show them how much they mean to you. BFF 4EVER!